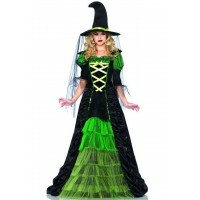 Cast your spells to disarm all who see you in this stunning 3 piece Celestrial Witch costume with pentacle bodice. Channel dark energy with your belted pentagram halter velvet dress. The overlaying shimmer star skirt adds a magical touch to your look and of course you will have your matching witch hat to wear for every supernatural encounter you face. The mini dress on it's own makes a fun every day or club dress with color blocking and pentacle bodice. Item Number: LA-c86706 | Approximate Size (Inches): 10.00 wide x 3.00 deep x 14.00 high | Approximate Shipping Weight: 2.00 lbs.